If you were counting on finding small hearts in the grass, you'd better forget it right now! And if you were expecting to find some Pieces of Heart, well you're going to be disappointed. 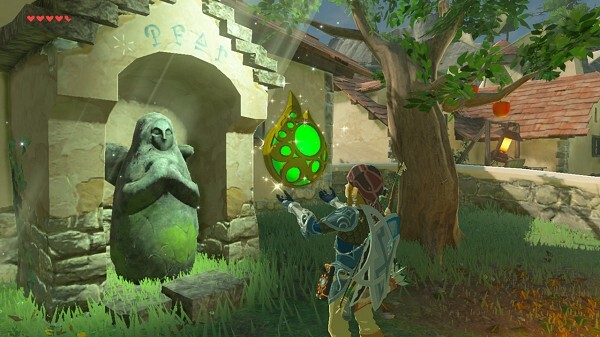 In Breath of the Wild, to have more heart containers, you have to find some shrines and succeed at the Goddesses' trials to get some Spirit Orbs. When you've found 4 of them, go see a goddess statue and for 4 orbs, she'll give you the choice between a heart or a stamina container, which will increase your stamina gauge. There's also a new feature: the temporary yellow hearts. These hearts are added to the red ones, but once they're lost, they're lost forever. To get some health back, you have to eat some ingredients or even better, cook some meals. You can also get all your hearts back by spending the night at an inn for the modest price of 20 rupees (for a regular bed). 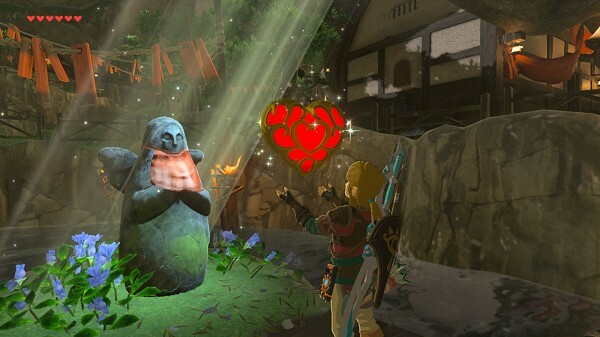 If you choose a deluxe bed (40 rupees), in addition to getting your full hearts back, you get a yellow heart. You can also slowly get back your hearts by bathing in the Gorons' hot springs. Even if the following note doesn't concern the containers, neither does it directly concern Link, it still has a link to the hearts and life, because Link can ressurect a horse that died because of an enemy attack or by accident. To do so, you have to go in the Faron Grasslands, on the Ibara Butte, and find some kind of different fountain. 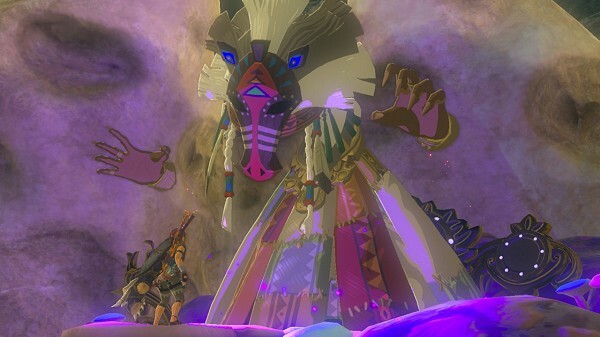 Look at it, give 1000 rupees to the mysterious voice, then Malanya, this world's horse god, appears. If you're sad over the loss of your horse, he can resurrect it. If you need his power a second time, he'll ask for an Endura Carrot, that you can easily find next to the Great Fairy Fountains.